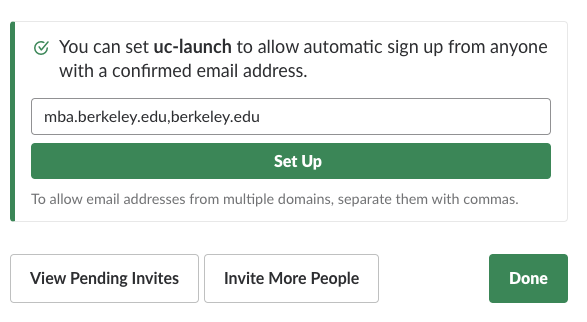 When adding/inviting additional team members to a new Slack instance, if the user adds multiple users from the same domain, Slack will prompt the user to setup domain-based automatic sign up. This feature allows users who have an email at the domain specified to sign up automatically without needing to be invited. This not only spotlights a feature that the user may not know exist, but it does so at a relevant time (when a user is inviting other users) when that feature can be most impactful. This generates goodwill on behalf of the user because Slack is adding value to the interaction without any effort on the part of the user. It also encourages the user to explore a feature they may not have encountered otherwise.